By Aaron Friedman. Aaron Friedman is a Healthcare & Life Sciences Solutions Architect for Amazon Web Services. What an exciting time to be building healthcare and life science solutions on the AWS Cloud! One of my favorite things about my job is seeing the industry-shaping solutions that our HCLS partners are building. To highlight some of these solutions, we hosted our first pre-day at re:Invent 2016 with both Healthcare and Life Sciences tracks featuring many of our partners, including ClearDATA, Cerner, and 1Strategy. Many other partners, such as OpenEye, gave HCLS talks throughout the week. All of these talks, and more, are available on YouTube. In the past several weeks alone, there have been myriad launch announcements of new services, and updates to existing services, that will likely become part of your HCLS solutions on AWS. We have already heard excellent feedback about how our HCLS partners intend to use many of these services, such as Amazon Athena, as part of their analytics pipeline. Please note that new services are not necessarily HIPAA-eligible; you can learn of all HIPAA-eligible services here. However, you can use any AWS service in a HIPAA-compliant application if it does not touch PHI. If you have any questions, please do not hesitate to reach out to an AWS Solutions Architect and we are happy to help. While there are too many announcements to cover each in detail, I wanted to highlight some 2016 launch announcements that I am very excited to see how our partners use in 2017. DevSecOps. As our CTO, Werner Vogels, is fond of saying, security will always be our number one priority. So we’ll start with that! One of the things we have seen over 2016 is a focus in developing products for our partners interested in security and a highly integrated factory for delivering code to production. This is especially germane to many of our HCLS partners who are developing software for compliant workloads (HIPAA, regulated workloads in biopharma, etc.). With regards to compliance, one of the things that HCLS partners focus on is traceability. An auditor of your system might want to know who developed a specific portion of your software, what your environment looked like on a specific date, and the corresponding controls and tests that you have put in place to enforce these standards. I am particularly excited about the growth of AWS Config, which allows you to monitor your resources and get configuration change notifications to enable security and governance. Managed Config rules allow you to get started easier with monitoring your environment, and move towards automating compliance. In a similar vein, we recently announced support for AWS CloudFormation in our continuous delivery service, AWS CodePipeline. Not only can you use continuous integration/continuous delivery to test your software (built with AWS CodeBuild), but you can now validate changes to your environment as part of your CI/CD process. Traceability is not only important for compliance, but also for the customer experience. In this vein, we launched AWS X-Ray, which allows you to dive deep into your applications and understand how its underlying services are performing. You are able to quickly and easily detect where issues are occurring and correct the root issues in your software. This allows you to tune every portion of your application, and deliver even better customer experiences while operating in a compliant environment. Data Analytics and Business Intelligence. 2016 has seen rapid delivery of AWS products and services that enable you to more easily derive insight from your data. Often built on top of data lakes on AWS, both population health analytics and real world evidence platforms are becoming increasingly common. At re:Invent, we announced several services that will allow you better query that data and derive meaningful insights. Below is one example of how I see these services working together in concert in your HCLS solutions. 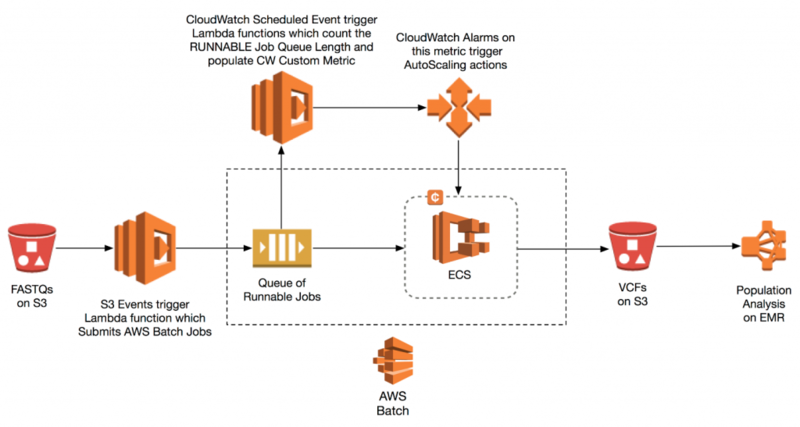 AWS Glue, coming soon, will be critical for connecting the data generated from these batch analytics with many other data source for your real-world evidence and healthcare analytics platforms. With AWS Glue, you can integrate data from genomics, anonymized health information, metabolomics, microbiomics, and proteomics into a central repository of knowledge to derive insights from. Not only will Glue allow you to automate your ETL processes, but it will also help you better understand your data sources and suggest database schema and transformations so you can focus more on data discovery, rather than data wrangling. Once you have your data sources organized, you can then use Amazon Athena, a managed interactive query service, to easily analyze petabytes of data in your data lake on S3, which you may have generated with AWS Batch. We envision our customers using Athena to explore their population-scale (e.g. health or genomics) datasets through low-latency queries, which will inform more complex analytic models, such as ones built with our Deep Learning AMI and P2-class GPU instances. After you have analyzed your data and built the appropriate models with Athena, EMR, and machine learning, you can then serve that data with Amazon QuickSight to your organization so that it can get the appropriate business insights from your data. QuickSight should be very valuable to our partners with GxP workloads, such as with operation analytics and supply chain management. HIPAA-Eligible Services. We hope that HCLS partners are as excited as we are to see the expansion of HIPAA-eligibility in database (RDS for PostgreSQL and Aurora), as well as storage (Snowball). We are looking forward to seeing how HCLS partners are able to leverage these newly-eligible services for storing, transmitting, and processing PHI. Partners and customers may use any AWS service in an account designated as a HIPAA account, but they should only process, store and transmit PHI in the HIPAA-eligible services defined in the BAA. Learn more here. It’s truly an exciting time to be a Healthcare and Life Sciences partner at AWS, and with all of these services and more, it always feels like Day One. We are consistently listening to our partners, and seek to build products that improves both their experience as well as that of their customers. If you are interested in learning more about our Healthcare and Life Sciences partners, be sure to check out our Competency Partners, as well as explore our newly launched AWS Partner Solutions Finder. Please leave any questions or comments below. I’d love to hear from you.